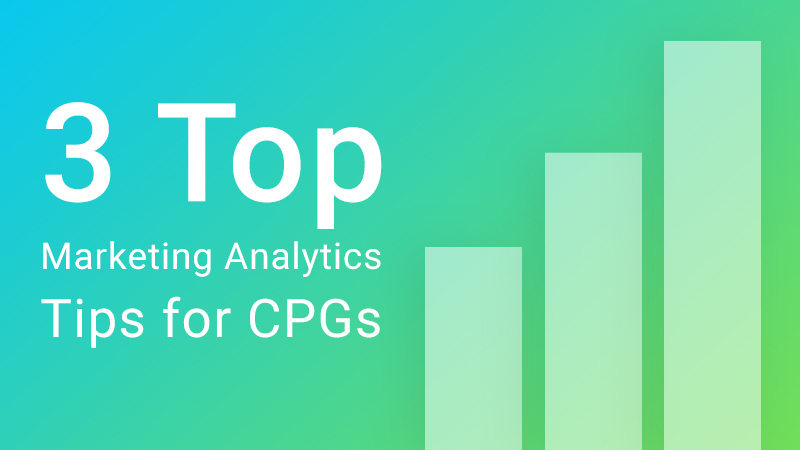 Between the explosion of data available in recent years and continued advancements in business intelligence (BI), your consumer packaged goods (CPG) company is likely well-positioned for an analytics overhaul. In the marketing analytics space in particular, there is plenty of opportunity for improvement and growth, and you can bet that your competition is taking full advantage. Combine market research with demographic and retailer data to get a more well-rounded view of your customers and their shopping habits. Once you know your customers better, you’re closer to understanding why consumers purchase what they purchase, how they feel about your brands and products, and much more. The more complete your consumer knowledge is, the more effective your marketing efforts can be. Take advantage of an advanced marketing analytics solution to gain that deeper level of knowledge. This article seeks to help you identify areas in which your consumer goods marketing department can make better use of your data and improve performance. Isolate the decisions you want to improve with analytics. Open up data access and interdepartmental communication. Focus on forecasting and hindsight analytics. We’ll go into much greater detail about each of the strategies listed here in the sections below. CPG Marketing Tip #1: Isolate the decisions you want to improve with analytics. Start with the results you’re looking for. You have tons of data from a range of sources, both in-house and syndicated. You also have quite a bit of flexibility when it comes to the analytics platform you use, with everything from traditional BI tools to augmented analytics solutions to many options in between. If you don’t set clear objectives and goals from the outset, you’re going to end up lost in the data and the software. And, rather than maximizing your marketing performance, your team’s efficacy and efficiency will suffer. An article from McKinsey & Company calls it “decision back” thinking. “As they embark on a data-and-analytics journey, companies should take a “decision back” approach that begins by crisply answering one question: which decisions do we want to improve?,” states the article. What question or short list of questions does your CPG marketing team need to improve? Do we want a better understanding of customer purchase tendencies? Should we perform attribution studies to isolate which channels are the most profitable? Do we need a broader understanding of the customer journey in the omnichannel experience? Whatever your team’s core questions are, those should be the driving factor in the analytics platform you work with and what data sets and information you focus on. Once you have mastered the analysis process for your top priority questions, expand out to other complicated areas in need of evaluation and growth. CPG Marketing Tip #2: Open up data access and interdepartmental communication. Your approach to data and analytics should not be siloed. In fact, if you have not already, you need to democratize your approach to data. There are two layers of problems that occur when you don’t democratize your data. Despite having the data you need to make informed marketing decisions, you do not have access to it because it is housed with a different department or business group within the company. There are limited cross-department insights. Sales or finance might have performed an analysis that’s relevant to marketing, but you could have missed out because it was with data you do not have access to or within a system that your team does not use. Make data accessible. Make analytics accessible. A specialty retailer sought to redesign the promotional mailings it sends to the more than five million members of its loyalty-card program. While the program had been successful, revenue and profit from loyal customers was stagnating. The retailer recognized that by combining data from various functional groups — in this case, customer loyalty, marketing, and merchandising finance — it could identify subsegments among its loyal customers and figure out what types of direct mail resulted in the most incremental profit for each segment. Learn from this example and see what data your marketing team is lacking and what departments have reports and information that would be helpful for your bottom line. CPG Marketing Tip #3: Focus on forecasting and hindsight analytics. It’s far too easy to get into a loop of analysis that is stuck in the past rather than focused on the future. Historic data and performance are crucial. They are how you know where you stand and how you have been doing. How did our recent campaign perform overall? How did X marketing program perform as compared to Y program? What are our year-over-year Z program sign ups? Once you’re comfortable with your grasp of hindsight analysis (and success will rely on open data access and the right analytics solution), you need to start focusing on the future. This is where you’ll identify pockets of growth and get ahead of your competitors. In terms of forecasting, there’s software dedicated to predictive analytics. But even without software that uses algorithms for predictive modeling, you should still be approaching your data with questions that answer why and how something is happening. For a platform that answers the why and how, look for solutions that fit what Gartner has coined augmented analytics.